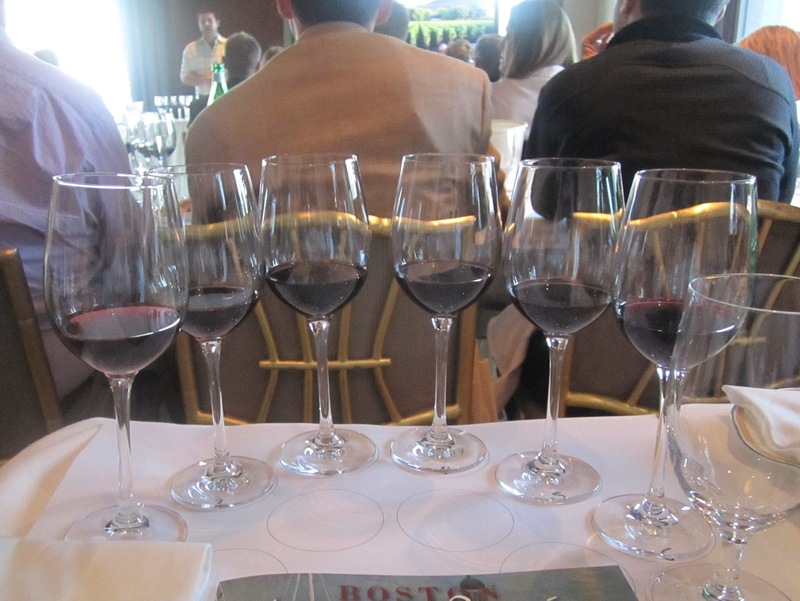 The Boston Wine Festival at the Boston Harbor Hotel featured the Wagner Family of Wines this past week. A seminar with six Caymus Special Selection Cabernet Sauvignons from 1990-2009 proceeded a paired dinner featuring other Wagner Family wines. Representing the winery was Joseph Wagner, son of Chuck Wagner of Caymus fame. Along with his three siblings, Joe represents the next generation of Wagner winemakers and is responsible for the current direction of their Pinot Noirs (Belle Glos and Meiomi) and the future direction of their red wines. Unlike Mondavi, which chooses to market all of their wines under lines bearing the family name, the Wagner Family of Wines contains a fleet of individual brands: Caymus (Cabernet), Belle Glos (single vineyard Pinot Noir) and Meiomi (appellation Pinot Noir), Mer Soleil (Chardonnay), and Conundrum (entry level white and recently red blends). Recent campaigns seek to tie these brands together. For me, having enjoyed their wines over the years and after this tasting, the common thread is delicious fruit forward wine that delivers value and enjoyment at each price point they compete at. I'd never been to an event at the Boston Wine Festival before. This is not to be confused with the Boston Wine Expo which is (primarily) a large tasting that occurs in January. The Wine Festival is a series of paired wine dinners at the five-star Boston Harbor Hotel prepared by chef Daniel Bruce. The evening started off with a sit-down seminar moderated by Joe Wagner featuring six vintages of Caymus Special Selection from 1990-2009. 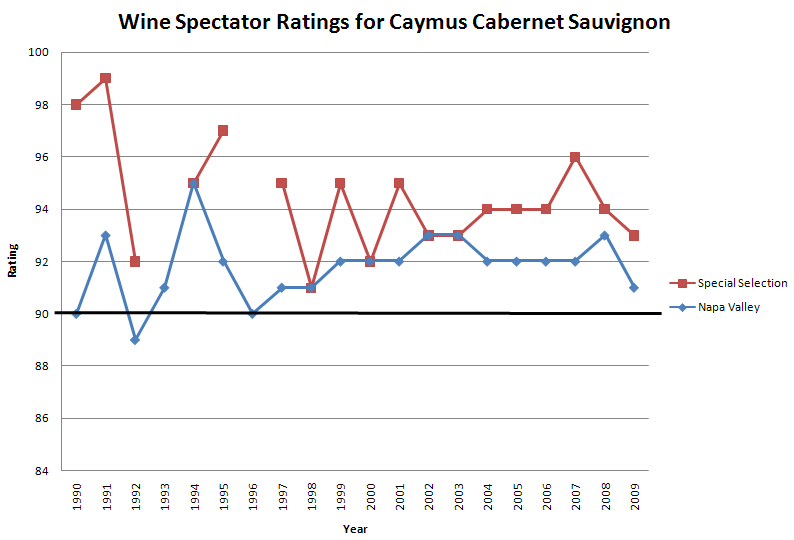 Two Caymus Special Selection Cabernet Sauvignons have been named Wine Spectator Wine of the Year: The 1990 ($75 release price) and the 1984 ($38 release price - doesn't that sound nice?). Wagner described a style shift in Napa Cab in the late '80s/early '90s where many producers stopped trying to emulate Bordeaux in California - Caymus included. 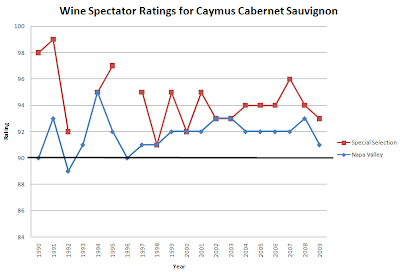 Perhaps the most notable difference between Caymus and Bordeaux is how enjoyable Caymus is immediately upon release. A question from attendees along these lines asked what the optimal age for enjoying Caymus Special Selection is. Joe said it was a matter of personal preference. Their wines are meant to be enjoyable on release and to evolve and develop over time. His preference is to enjoy Special Selection at 7 years after vintage. 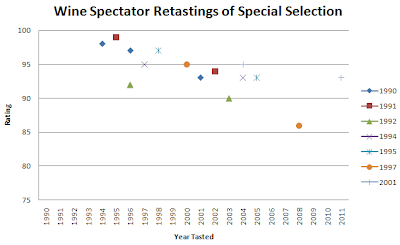 These days the Special Selection carries a retail price of $130 (29,000 cases produced) and the Napa Valley retails for $68 (71,000 cases produced). With these higher production levels they're definitely available at retail outlets - including your favorite deep discounters. The Special Selection seems to bottom out around $99 and the Napa Valley around $59. If you can find them for less, buy 'em! According to Wagner, the difference between the Napa Valley and Special Selection is that the special selection comes from the best lots, has a more substantial oak regiment, and is intended to be a classier wine. Perfume, florals, caramel, toasty oak, super-well integrated. Slightly skunky - strange. Reminds me of the smell of oak in a cellar. Aged in 100% French Oak 2-3 years. Sour cherry, plum. Easy drinking. Cellar oak. Lots of sediment. Huge jump in style here from the 1994. "A stellar year in Napa." Cinnamon. Pleasant. Right in the middle of the age spectrum. Nice initially but falls off a bit on the mid-palate. Pretty nose, but I don't know if I like it enough to see how it's a $100 wine. Substantial sediment. Cola, black currant, vanilla, and dark fruit. Really nice stuff. Like this one a lot. This is at the 7 year mark Wagner mentioned and I love it. Fresh and inviting. Lively young primary fruit. Cream soda. Quite sweet. Absolutely delicious but this is pushing it even for me. Wow - it's tasty though. This is so utterly different from the 1990 it's almost hard to compare. The trend here for me is similar to what I've experienced as I've tasted other aged Napa Cabs: There are diminishing returns after 10 years. I agreed with Joe Wagner's preference that the wine was showing at its best 7 years post-vintage. The wines are good upon release. They change substantially in the next couple years. Then they begin a slow progression into a very soft and less substantial presence than they had on release. I discovered something interested as I was pulling the Spectator ratings for the plot above. I found that James Laube had re-tasted these wines with regularity as part of retrospective tastings. Notice in the plot below how all of the re-tastings were lower than the wines were rated on release. It makes me think twice before saving this style of wine for special occasions in the distant future in hopes that the wines improve significantly with age. 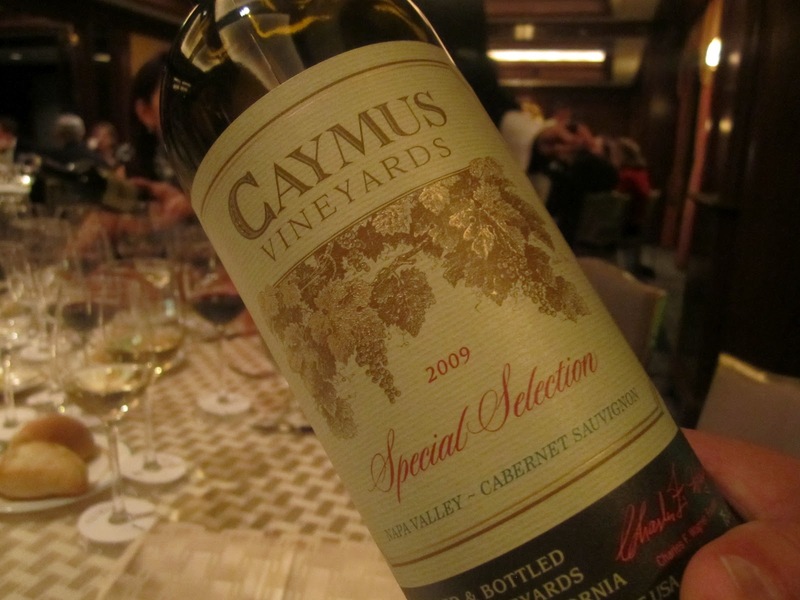 The Caymus brand is a staple at nicer restaurants, regularly featured alongside Cakebread and Silver Oak. See how it fared in this Steakhouse Cab Blind Tasting. Further Reading: The second half of this evening where we tasted the rest of the Wagner Family of Wines paired with dishes from Chef Daniel Bruce. I'd love it if you subscribed to the Wellesley Wine Press to keep in touch. Disclosure: I attended the event on a complimentary blogger pass. Question of the Day: What do you think of Caymus Cabernet Sauvignon? What's your rule of thumb in terms of aging Napa Cab for maximum enjoyment? Amazon Local is offering $40 to spend on wine and other merchandise for $20 at Wine.com. Shipping the first bottle generally costs about $12.95 so these deals are more appealing for those who have subscribed to Wine.com's Steward Ship program which covers all Wine.com shipments for a year for a flat fee of $49. I spent half a day tasting in Sonoma last week and I've got a lot of thoughts to share. I've visited Napa a dozen times, but this was just my third time tasting in Sonoma. A mistake I made the first time I visited - and maybe others have too - is expecting Sonoma to be a more affordable but otherwise just as good place to taste Cabernet Sauvignon. Sonoma is a cooler climate than Napa and therefore a better place to taste Pinot Noir and other cool climate varieties. If they're the varieties you're into then Sonoma may be a better place to visit than Napa. The name comes from a young couple that relocated to Sonoma from San Francisco: Matt Duffy & Sara Vaughn. I met with Matt at Vinify Wine Services - a custom crush facility for emerging winemakers where he works as a cellar master - to taste the two wines he produces: A Pinot Noir and a rosé. I first heard of Vaughn Duffy from @tgutting on Twitter. He seems to always be drinking wines from California Pinot Noir producers I enjoy like Siduri, Zepaltas, and Joseph Swan. I pinged him to ask what he thought were some up and coming producers I should check out. Vaughn Duffy was his recommendation. The wines I tasted were just the second produced by Vaughn Duffy Wines so we're definitely getting in on the ground floor here. Matt, as earnest and enthusiastic and kind as you can imagine, worked as an intern at Siduri so he follows a similar lineage as Ryan Zepaltas in that respect. While tasting his two current releases - a 2010 Pinot Noir and a 2011 Rosé - I asked about his winemaking philosophy. Although he enjoys leaner Pinot Noir for personal consumption he wants to make wines his family and friends will enjoy. That they'll love. And enjoy them I did. 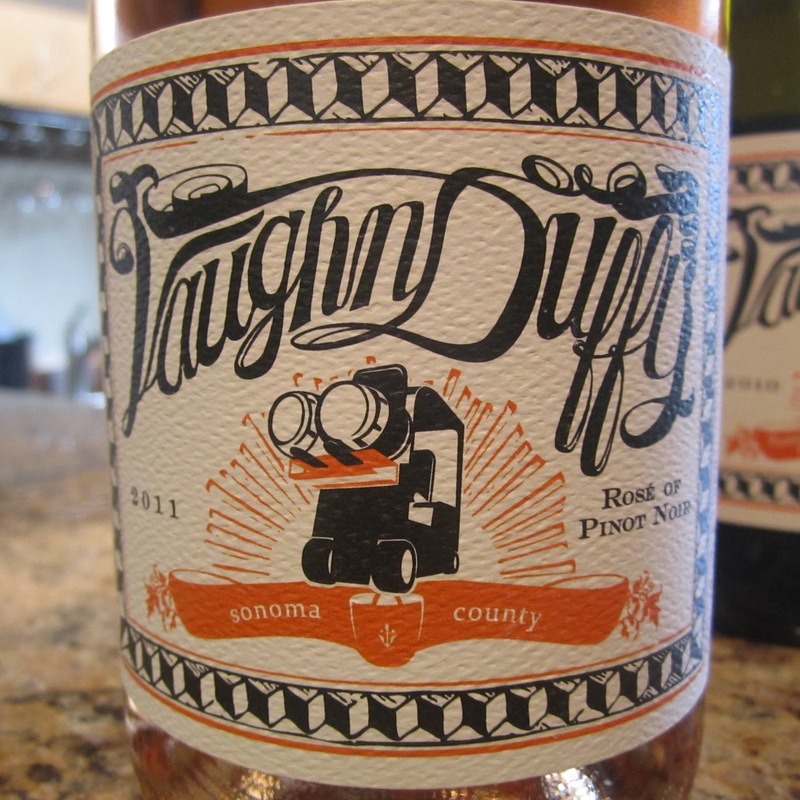 The prior vintage of Vaughn Duffy rosé landed on the San Francisco Chronicle's Top 100 list of 2011. Quite an accomplishment for the first wines ever released under this label. Matt makes this wine from juice bled from premium Pinot Noir grapes from clients he works with at Vinify. To pay their generosity forward he donates $1 from every bottle sold to Sonoma charities. No two vintages are exactly the same - Matt says the 2011 vintage took longer for fermentation to begin - but many of the same crowd pleasing characteristics found in the 2010 rosé are also found in the 2011. 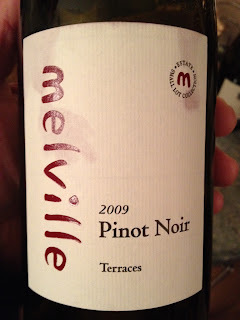 All of the winemakers I spoke with agreed that 2010 was a tough vintage for Pinot Noir. The growing season was extremely cool and grapes were slow to ripen. To assist ripening, leaves were removed late in the season. Then a rogue heat spike late in the season with temperatures well over 100F came along and fried exposed grapes. When I hear that a vintage is "challenging" I tend to treat that as an indicator I should buy selectively. I asked each of the winemakers I spoke with about this and they said that good producers won't put out bad wines. If the grapes were truly fried they wouldn't have been picked. So what we'll see with 2010 Pinot Noir is reduced yields but good wines from good producers. Although the 2010 Vaughn Duffy Pinot Noir is labeled "just" Russian River Valley, it could technically be labeled as a single vineyard wine. The grape source for the prior vintage was the Suacci vineyard (where Zepaltas and others have produced single vineyard Pinot Noirs in the past). However, in 2010 a fire near the Suacci vineyard imparted smoke taint on the Vaughn Duffy rows within the vineyard. As if the challenging overall weather conditions weren't enough! So Matt sourced grapes from the Desmond vineyard which is southwest of Windsor in the Russian River Valley. This is traditionally a warmer site so Matt thought the cooler growing season would be a good one for Pinot Noir. Based on what I tasted in the bottle, I think he was right. The innocent light peach color did little to prepare me for how electric this wine is. Made using the Saignée method - juice bled from pressed Pinot Noir. Peaches, watermelon, and floral aromatics. Slight residual sugar is balanced wonderfully with sharp acidity. It's hard to imagine this bottle of wine at a deck party going unfinished. Terrific. For my palate, this is a delicious wine. Ripe strawberries, cherries, and a round voluptuous personality. Fresh. Pure. Friendly. Hard to stop tasting. Just the second vintage from Vaughn Duffy. I like the style here. Visit VaughnDuffyWines.com and sign up for their mailing list. If you're a New England friend and would like to go in on a mixed case with me drop me an email (wellesleywinepress@gmail.com) and let me know. I'd prefer to amortize shipping costs across a larger order. Lots more to come. Littorai, Kosta Browne, Zeptaltas, and more. I'd love it if you subscribed to the WWP to get regular updates. 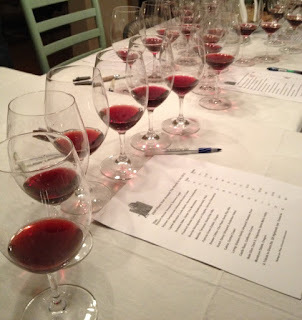 I had mixed emotions as I was driving to a blind tasting of 2009 Pinot Noir this past weekend. When Wine Zag blogger Adam Japko announced the tasting I was thrilled because I've been enjoying so many 2009 California Pinot Noirs lately. But as the night was upon us I looked at it differently than other tastings I'd been to. Would I be able to pick my favorites out of the line-up? Would I be able to differentiate California from Oregon and elsewhere? Would my favorite be a cheap wine - and make me feel like a fool for spending so much energy chasing after and exploring increasingly obscure producers the past few years? The line-up included producers I'm familiar with and enjoy like Sojourn, Belle Glos, and Loring. Familiar names like Patricia Green, Melville, and Calera. Some I was looking forward to trying for the first time - especially Kutch. Some old world Pinot Noirs, including a few Burgundies, were thrown into the mix as well. And a low-priced ringer: Castle Rock. All of the wines in the tasting were 2009s, and the focus was primarily on California. Wine Spectator has called 2009 California Pinot Noir the best vintage ever. 2009 red Burgundy is said to be an amazingly fruit forward vintage. A perfect time for folks like me to explore the region. 2009 Oregon Pinot Noir hasn't received the accolades 2008 did, but 2009 is a warmer vintage and the wines are more generous on release as a result. More like 2006 Oregon Pinot Noir - which I liked. The wines were tasted blind in 3 flights with the wines assorted randomly. We knew the wines being tasted and their price points but we didn't know which of the 17 wines was which. Thoughts on the flight: Tons of stylistic diversity here. Guessing a lot of these aren't from California. Probably a couple are from Burgundy or Oregon. Not as much diversity here. Thinking all of these are from California. Good wines but no huge standouts. Best flight of the night. Diverse and a couple of standout what I'm guessing are California Pinot Noirs. The wines from Sojourn, Brewer-Clifton, and Melville showed well for me personally. And Sojourn and Brewer-Clifton showed well according to the group at large. Belle Glos caught my eye on the list going in. I though it would be a benchmark wine of sorts that I might even be able to pick out having tried several bottles of their single vineyard wines and detecting a consistent stylistic pattern. But, speaking in March Madness terms, it was upset in the first round. The wines from Oregon (Patricia Green and Montinore Estate) didn't do particularly well either. 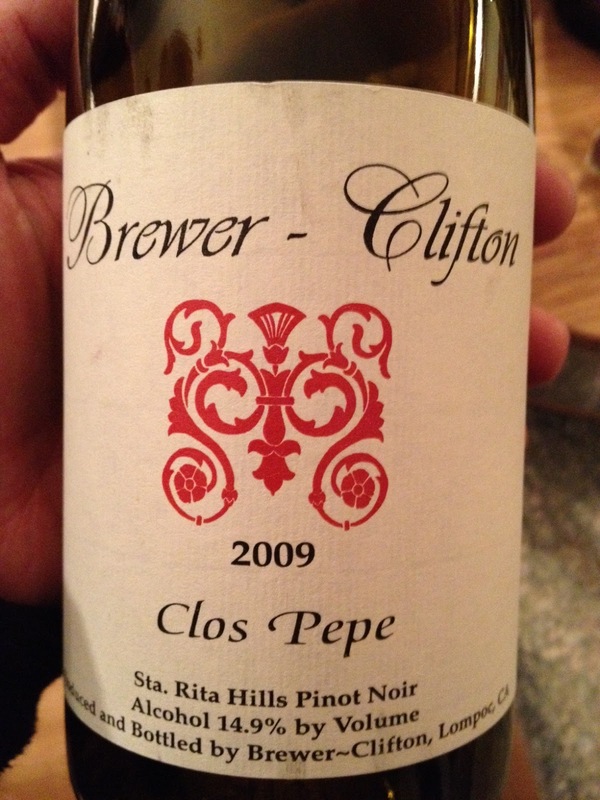 A late entry - an $18 Italian Pinot Nero - tied the Brewer-Clifton for wine of the night. Quite an accomplishment for such an affordable wine. And who says bigger wines always show better in this kind of tasting? I'd never tried Kutch but finishing near the back of the pack - and weighing in at $68 - has me spooked. Also, the most expensive wine in the tasting - a $70 Burgundy - didn't do much to impress either. Powerful with ripe strawberry and fresh produce aromas. Caramel notes remain in the glass after a couple sips, but it's balanced with fresh fruit and layers of more serious structure. Complex. Love it. Tied for 2nd amongst the group, this was my favorite wine of the night, and just a bit better than the Melville Terraces in the same flight. The Sojourn showed a purity of fruit and balance that others were lacking. Pleased to see this producer come out on top. Ooo - pretty. Pure California. Round. A little heat. Is this Melville or Belle Glos perhaps? I've enjoyed Melville's entry level bottling (~$30) even though they occasionally have some rough edges and a little heat. This one was very nice. Edged out by the Sojourn because I thought the Melville's fruit was obscured just a touch behind what seemed like a fairly substantial oak regiment. Powerful flavors but balanced nicely with a good amount of acidity. Really nice. With a touch of heat it clings to the glass. But it's vibrant. This could be Sojourn. Or Belle Glos? I had no experience with Brewer-Clifton prior to this tasting. I hear the winemaker is the same as Melville so maybe it's not surprising to see them near each other in my rank order. A little on the spendy side but I'd buy more of this if I could find it in the $40s retail. Limited aromatically but radiant and flavorful. Elegant. Pretty. If this is California, it's doing it in a restrained style. Kutch? A nice surprise here from an affordable producer I'd never heard of. And from the Santa Cruz Mountains too. If this is what I think Kutch would taste like after reading about Kutch, and this wine is quite a bit more affordable, I'll definitely be seeking this one out. Happy magenta color but the flavors are melancholy. Beautiful nose of black cherry, raspberries, and mushrooms. Secondary flavors of cola and coconut. Long finish. Like it. 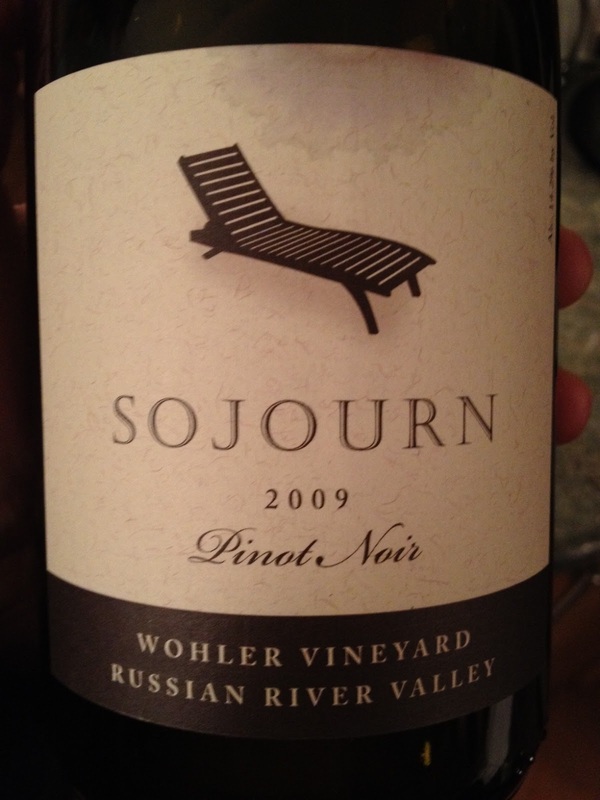 Another winner for Sojourn and looking back on the notes it sounds like one of the most compelling wines of the night. Would definitely buy again and recommend others check out Sojourn. They've got one of the most consumer-friendly mailing lists I've come across. Dark in color. Caramel, then strawberries and cranberries. Some rough edges. Is this Sojourn? Might be a little much, but it tastes really good. Could this be Belle Glos? A solid showing here for Loring and the tasting notes are not too surprising having tried a number of their wines from this and recent vintages. Along with Siduri I consider Loring to be a bell weather value-priced high quality California Pinot Noir producer. The single vineyard bottlings climb up a bit in price. As with many single vineyard wines I'm not sure they're always worth it. Another consumer-friendly mailing list to check out. Oregon? Bubble gum. Don't think it's got that California Pinot Noir flavor profile. Nice, but not my favorite. Lively fresh fruit. Highish viscosity. Probably California. Straightforward. Tasty. Tied for 3rd in the group. 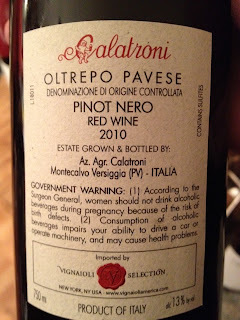 Pretty much in line with what I wrote when I tasted this non-blind for the first time a couple weeks ago. I like this around $20 and my enthusiasm would increase more closer to $15. Can't see my way to the 92 point rating and accolades Robert Parker bestowed on this one but it is very good in my opinion. Think this one is from Oregon. A little green and twangy. Low viscosity. Pretty, but not my favorite. Affordable and interesting to try a Pinot Noir from Germany. Very enjoyable and surely from California. 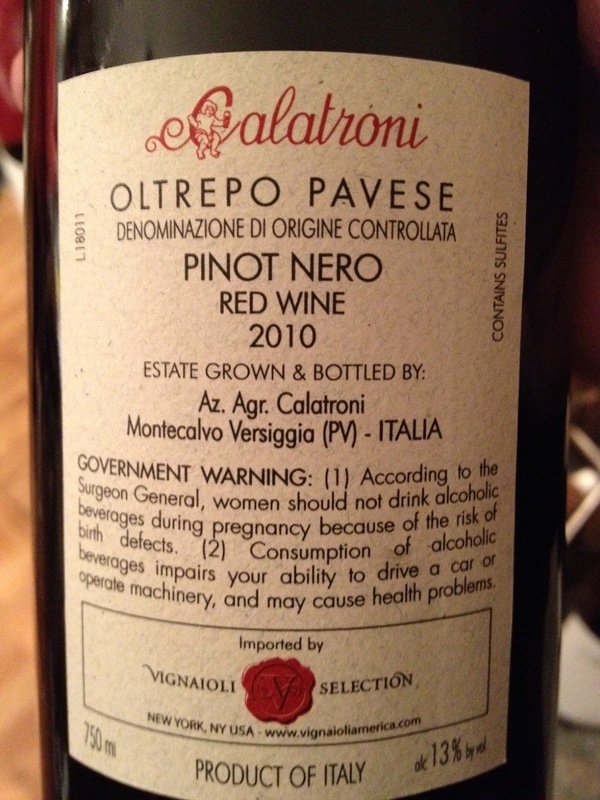 Liked it a lot but it lacks some markings I look for in California Pinot Noir flavor-wise. A little dusty and quirky. Pretty strong showing here for a widely available wine that can be found significantly south of $10 if you look around. Leuden's cherry cough drops which I tend to like, along with some vegetal components that knocked it down a bit. Is this Grenache? Tied for 2nd in the group. An affordable Burgundy with some things I liked and others I didn't. Tied for 3rd in the group. Light in color. Muted nose. Some quirky notes. Germany? Not California. Well this one confused me. I was surprised to see a California Grenache so light in color compared to Pinot Noirs. Interesting. Flinty with quirky bubble gum notes. Not bad but quite a few off notes. I think I said at the time, "typical Burgundy: An expensive wine nobody really cares much for". Nobody at the tasting had anything nice to say about this one and it was the most expensive wine tasted. I know it's a far reaching generalization to bag on Burgundy and some day I'll come back and laugh at myself for being resistant to Burgundy's charms, but this one did little to compel me to go deeper into Burgundy. The Wine Advocate rated this wine 90-92 points. Smoky. Some slight nail polish notes distract. A really nice wine but too many off notes. Definitely California. Wow. What a huge surprise to see a single vineyard Belle Glos show so poorly blind when I've found their wines to be so utterly (and reliably) delicious. I will say that the Clark & Telephone is my least favorite of the 3 single vineyard Pinot Noirs they produce (Las Alturas being the favorite, and Taylor Lane being the second favorite). I was disturbed by this result so I opened another bottle of it the next night at home. While I can see why I wrote the things I did, when tasting on its own there's no way I would have rated it this low. This wine has a unique style. It's bold and yes some of the notes are a little less than pure fruit. I'd probably rate the bottle I tasted from at home 90 points. Blind tasting is humbling once again. For a moment I thought this wine might be corked but it wasn't. Pungent with fruit that's muted and dominated by menthol (spearmint?) aromas. Low viscosity. Don't think this is from California. Quirky. Perhaps more of a disappointment than the Belle Glos. I'd never tried Kutch before and I just finished a month-long search to acquire some. Now I'm wishing I'd shown more restraint. I've read that their wines used to be bigger but were showing more restraint in a Rhys-like manner lately. Come to think of it I wasn't too thrilled with a bottle of Rhys I opened recently either. Definitely interested in trying more but will try my best not to fall under the spell of the pretty label. Perfume nose. Falls a little flat on the palate. Kind of fake-tasting. Tastes like California but not high quality? Totally missed the mark here. 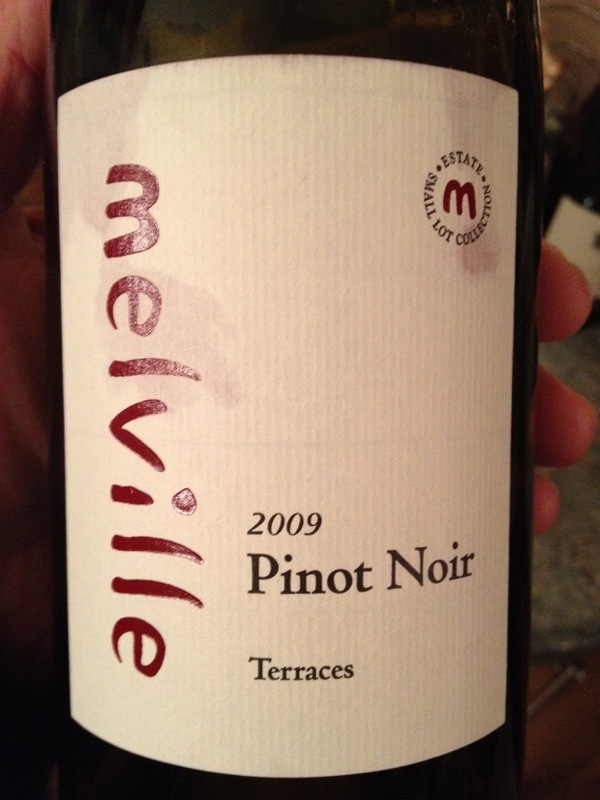 I had a bottle of this ('08 vintage) and thought it was good but typical Oregon Pinot Noir. My tasting note makes it sound like I thought maybe this was the Castle Rock. Not from California and possibly flawed. Smells of damp cellar floor or Home Depot near the fertilizer. Well, it wasn't from California. I didn't hear anyone else say TCA so I don't think it was flawed. But it was funky. What a tasting - full of winners and losers, surprises and shockers. Once again blind tasting proves to be a valuable tool for removing bias and analyzing wines without preconceived notions. It was reassuring to see the Sojourn wines show well in this blind format. But not just for their brawn (some call them a Cab-drinker's Pinot Noir) but for the diversity they showed. They're definitely allowing the personality of each site to be reflected in their wines, but showing them in their best possible light. Like a portrait photographer. 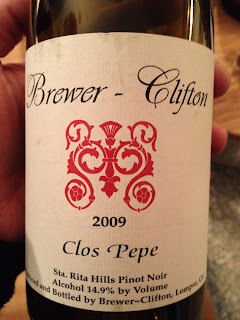 The wines from Brewer-Clifton and Melville, along with some other recent favorable experiences from the region renew my enthusiasm for exploring Pinot Noir from Southern California. They're often plush and forward but when done well like these they can be quite enjoyable. Both the Sojourn Wohler and the Brewer-Clifton Clos Pepe showed well with the group. The $18 Italian Pinot Noir tying for 1st in the group was quite an accomplishment. I liked it (but didn't love it) and would be open to trying more Italian wine made from this grape. The Domaine Eden (91 Wine Advocate, 91 WWP) is an intriguing play. I'd like to learn more about them. If you like California Pinot Noir I'll be writing up a trip report from a recent trip to Sonoma. I'd love it if you subscribed to the Wellesley Wine Press to hear about those visits. Question of the Day: What do you think about these results? Or blind tasting in general? 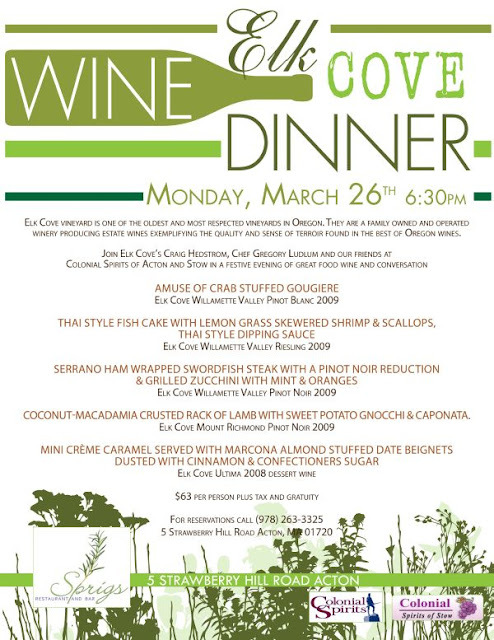 Sprigs Restaurant in Acton, MA is offering what appears to be a fantastic dinner featuring wines from Elk Cove Vineyard. $63 per person gets you a 5 course meal paired with wines from Elk Cove, many of which we don't see available at retail in Massachusetts. I've found Elk Cove to be a reliable producer, vintage after vintage, of reasonably priced delicious Oregon Pinot Noir. Their wines always seem to deliver ample fruit while respectfully reflecting where they come from. Click the menu image below to visit the Sprigs website and learn more. Thanks to friend and reader A.L. for the heads up.